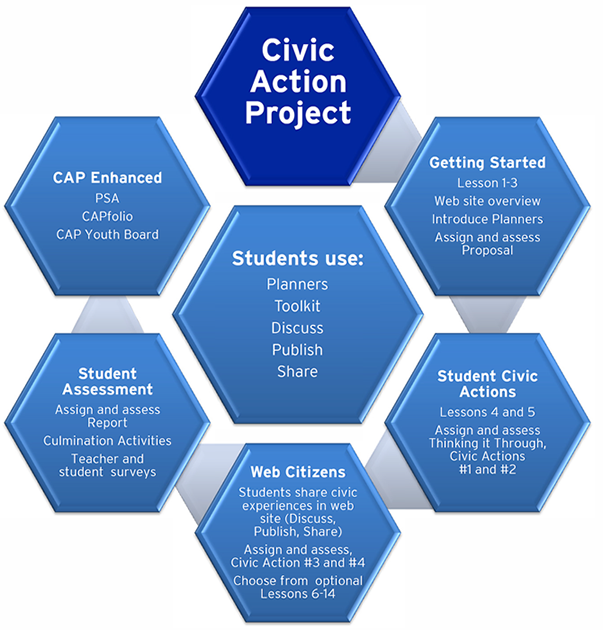 CAP is a free project-based learning program for civics and government. Think of it as a culmination of students’ social studies education, a chance for them to apply what they have learned to the real world and impact an issue that matters to them. From the CAP curriculum, you will first teach three lessons that are tied to government/civics content. These lessons provide content that students will need to start their own CAP projects. Once students start working on their own CAP issues, you will teach two more lessons that focus on policy analysis. CAP provides a bundle of additional lessons for you to choose from, based on the needs and interests of your students. Students could select issues related to school, community, or even national or global issues. CAP students identify an issue or problem that matters to them, connect it to public policy, then take “civic actions” to try to impact their selected issue/problem. It is up to you, the teacher, if you want to limit the scale of the issues they choose. 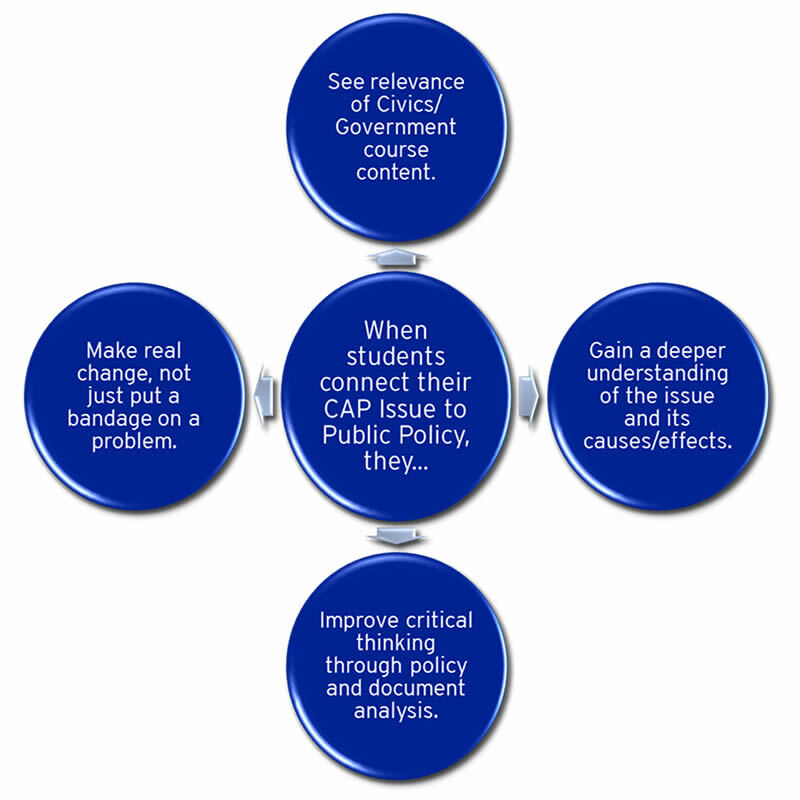 In any case, it is key that you require students to make the connection to public policy if you are integrating CAP into your government course. CAP alum and current Youth Board member Avery describes the impact of CAP on their understanding of policy and future career goals. CAP is aligned to the Common Core State Standards for English Language Arts & History/Social Studies, Science, and Technical Subjects. CAP supports the C3 Framework’s four dimensions. Are you looking for professional development for Civic Action Project (CAP)? We continuously adds resources to the website focused on how to implement CAP in the classroom. If you want to learn how to implement CAP on your own, here are some links to help you “do it yourself”! Take a look at each of the tabs. This will help you get started, gain an understanding about the rationale of CAP and its intended outcomes. Videos: Check out various CAP webinars we have posted. Videos: There are short videos that help you understand each of CAP core lessons. These same videos are also posted next to each of the five first lessons. Videos: There are several videos and other resources made by students, for students. These will help you, too! Register yourself on the CAP website and you will start getting email updates like Now Engaging, a newsletter specifically for CAP teachers that provides updates, tips, and showcases CAP teachers and students. You will also receive special announcements about professional development webinars and other online and face-to-face professional development events. Contact Gregorio or Laura to see if we can hook you up with a CAP teacher in your region who can provide you with some one-on-one coaching. Gregorio and Laura may also know of some face-to-face CAP sessions in your locale being conducted by CAP teachers or other non-profits we work with. Please know that CRF is continuously seeking funding to provide all CAP resources and professional development free of charge. If we are not currently resourced to serve you, we can provide the “fee for service” as described below. Contact Gregorio or Laura to schedule an after-school professional development session with CRF. Option A: Live Webinar for up to 30 teachers. We can design a webinar event tailored to your needs and schedule the session at a time convenient for your teachers. Option B: Face-to-face Introduction to CAP (2-3 hours) for up to 30 teachers. Many CAP teachers have learned to implement CAP by starting with a 2-3 hour session to get the basics. Please give Gregorio or Laura a call if you are interested. Cost: $750 covers the cost of CRF staff to plan and deliver one webinar session. Fee varies depending on location. $1,000 covers CRF staff time. You would need to cover any travel, site costs, and teacher stipends. Ideally, teachers are provided with a full-day of face to face professional development, followed by live, interactive webinars focused on key aspects of CAP implementation and ongoing direct or remote follow-up support depending on location of school-site. Costs vary depending on location, but on average, run approximately $1,500 per teacher over the course of *two semesters of implementation of CAP. The need for CRF staff travel may increase the cost. *We know that in many places, the Government/Civics course is one semester. Teachers may be teaching Government one semester and Economics another, thus it is possible that using CAP for two semesters will stretch over a two-year period. Do the lessons have to be taught in order? Only the first five lessons need to be taught in order. They introduce CAP and policy analysis. The remaining lessons may be taught in any order, based on student interest in the topic and teacher discretion. We recommend that you familiarize yourself with all the lessons. Please visit How Do I Get Started for simple instructions on implementing CAP lessons. What counts as evidence of a civic action? CAP defines civic actions as all of the things average citizens do to address a problem or issue in their community. Evidence may include notes and documents, photographs, and other tangible items related to what a student did. For example, if David goes to a public meeting, David may bring back a copy of the meeting’s agenda. If Susan interviews a public official, she may get a copy of the official’s business card. The CAP Planners themselves qualify as evidence of students’ civic actions. The Planners enable students to document civic actions they’ve completed, reflect on the results, and identify additional civic actions that they can take on. How many civic actions do students have to perform? There is no set number. The key is to encourage students to continue completing civic actions for the duration of their CAP assignment, which is typically 8–10 weeks. Civic actions should demonstrate how they are actively and thoughtfully engaged in addressing their issue while practicing the skills, acquiring the knowledge, and developing the attitudes of an effective citizen. Please visit our Student Action tab for examples of student actions. What if students accomplish their goal? Are they done with CAP? The goal of CAP is for students to practice addressing problems, issues, and needs in their community by completing as many civic actions as they can. As a result, they learn to be effective citizens. Accordingly, students should be encouraged to set additional goals and objectives that build upon their previous success. Chances are that the accomplishment of a short-term goal sets the stage for civic actions toward a more long-term goal. An option for enrichment in CAP is provided in the CAP contests. The PSA and CAPfolio contests provide cash awards for media products (e.g., a PSA or web page) that captures your student’s CAP experience and promotes the importance of civic engagement. Rules and deadlines can be found in the Contests tab of the CAP website. What if students do not accomplish their goal? This will be the norm. Affecting public policy is often long and difficult. Students should be told this going in. The CAP project consists of students practicing citizenship by completing as many civic actions as possible to become effective citizens. That is the project. It is a bonus if they achieve their goal, but it should not be counted against them if they do not. Students should consider archiving their CAP experience in a manner that would enable a subsequent group of students, concerned about the same issue, to build upon their previous efforts. Small Groups. The class is divided into groups of 2–6 students, and each group selects its own issue or problem to work on. Other teachers put students in groups (or have students self-select partners) and let the groups come to agreement on their issue. Whole Class. In this model, the teacher helps students reach consensus on a single problem or issue. Focusing on this one issue, students form separate groups that each address the problem in a different way. Independent Work. Individual students may be passionate about a particular issue not selected by any of their peers and could work independently on their own CAP. Teachers might choose to assign CAP in lieu of a typical research paper, wanting each student to do CAP individually. How can you help with getting students to “buy into” CAP? Assign CAP as part of your classroom course. Students who may not be as motivated to complete usual classroom assignments actually did better with the project-based nature of CAP, especially when it was made a regular part of the course. According to research and our experience, the most powerful thing teachers can do is put students in the driver’s seat. The more decisions that students make about their CAP issue and civic actions, the stronger their buy-in to the CAP experience. Check out the “Introducing CAP to Students” video featuring Roosevelt High School teacher Carlos Castillo to learn how and why he introduces CAP to his students. Increased knowledge about government class content, democratic ideals, and the role of citizens in a democracy. Ability to participate in civil and informed discussion with peers and adults about issues, including controversial issues. Acquisition of 21st century learning skills, including organization, collaboration, problem solving, presentation, and using technology. Acquisition and application of reading, writing, speaking, and listening skills. Development of positive civic dispositions, including understanding multiple perspectives, the will to try to effect positive change, and civic responsibility. Problem: Need lights in a public park. Civic Actions: Survey student body (find out many students do text and drive); talk to police department (find data on violations, fines, etc. ); look at state laws (find they have been strengthened recently); decide this is an enforcement issue and an awareness issue; conduct a community and school campaign to raise awareness of danger and consequences (Posters, social media, PSAs); work with police to see if reduction in violations during campaign. Problem: School restrooms locked during school hours. Civic Actions: Talk to principal (encouraged to talk to custodian); talk to custodian (learn that there are not enough resources to keep restrooms clean all day); research state education laws (find out it is code violation to not have restrooms available during school hours); show custodian and principal the code (restrooms unlocked). 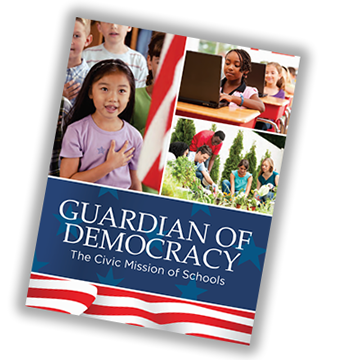 CAP was intentionally designed to support the Six Proven Practices in Civic Education. CRF worked with an advisory team made up of teachers, administrators, researchers, and civic education practitioners to develop CAP and to ensure that the proven practices were deeply embedded in its lessons and in the CAP experience for students. CAP is different than many other “civic project” models in that its lessons provide key government content that students need to be able to make connections between public issues/problems, public policy, government, and the role that citizens play. CAP uses a more real-world problem-solving approach, allowing students to try out an action and be informed by the results as to what the next action should be. Along the way, they will gain more knowledge about their issues as they research and talk to community members and policymakers, and they will use authentic problem-solving and critical-thinking skills. The teacher’s role is to provide instruction on government content (key content is provided in the CAP lessons) and to act as a coach to provide advice and guidance as students work on their CAP projects. CAP is designed to make sure that students get teacher approval on the issues they select and civic actions they propose to take. In addition to supporting civic-education research, CAP also provides a blended-learning model. The website is full of student-facing resources that are embedded where teachers and CRF have anticipated students will need them. For example, the CAP Planner requires students to describe how the issue they want to work on is connected to public policy. A video is embedded with that question that reviews five ways to connect an issue to policy, along with a document that provides even more explanation and examples. CAP is aligned to the Common Core State Standards for English Language Arts & History/Social Studies, Science, and Technical Subjects and supports the C3 Framework’s four dimensions. CAP supports the C3 Framework’s four dimensions. CAP provides a real-world project-based learning component for the high school government/civics course. CAP lessons provide essential concepts students need to make connections be tween issues/problems +public policy/government + citizens, as well as tools they need to be able to identify and address an issue that matters to them. CAP lessons make content relevant to students by using real case studies and examples of issues that other students have worked on through CAP. 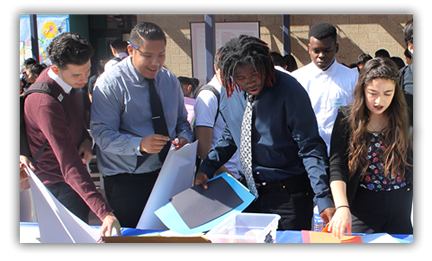 CAP supports best-practices in service-learning, and is implemented in many high schools as a Senior or “CAPstone” Project. For a detailed overview of the CAP rationale, research, features, and methods of organizing a CAP classroom, read A Teacher’s Introduction to CAP.